Yet another online travel booking website owned by Expedia, Orbitz is one of the best one-stop shops for the frequent traveler. In fact, many other booking sites such as Kayak will redirect travelers to Orbitz to perform their final booking. This is because Orbitz has decades of stability and great customer service to ensure that you get the best travel experience possible. In addition to flights and hotels, you can book rental cars, cruises, grab local entertainment tickets, and even bundle it all together for extra savings. Orbitz members save even more through the low price guarantee; if any user ever pays less than you did for the same price, you’ll earn back Orbucks. Those rewards are also available through using the mobile app and booking online, and can be used towards your future trips. In ranking all of the online travel websites owned by Expedia, Orbitz surely sits near the top. 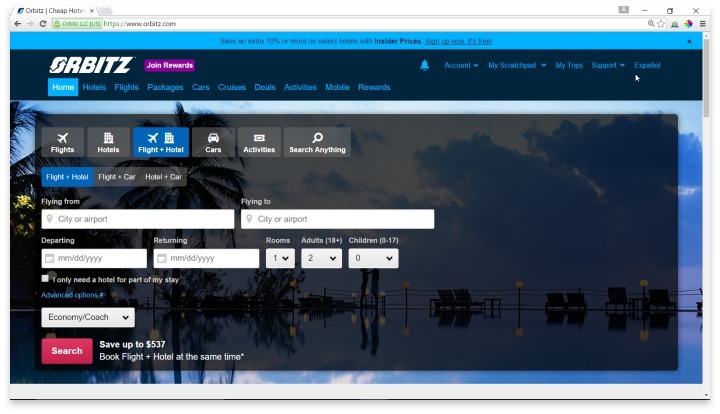 With the many booking options, including cruises and local entertainment, Orbitz makes it incredibly simple to get an entire itinerary prepared in just a few moments. Their search and booking system is so easy to use that the regular traveler can literally be through the entire process in the time it takes to dash into another meeting. The mobile apps from Orbitz are consistently rated some of the highest in the online travel booking industry. Using the app can save you big bucks, sometimes up to 50%, on certain purchases, and Orbitz members save even more thanks to the generous Orbucks system. Orbitz also has a great travel guide section that informs travelers of what kinds of events, sights, and recreation are nearby their destination. The consensus seems to be that this feature has something for everyone, with plenty of great places to check out. Members of Orbitz definitely have far more rewards and chances for savings than non-members. The Orbucks system is excellent, with no black-out dates, no waiting to redeem, and fast accumulation, especially when using the app. You can also choose to book your hotel and flight combo even if you only need part of your trip at the hotel. This enables you to get just a few nights at the same discounted package price, rather than having to pay full price, or for nights you don’t need. Additionally, the search feature includes a range of dates so you can search three days before and after your projected trip dates to get the best deals. With Orbitz you can book flights, hotels, rental cars, cruises, local entertainment tickets, and even bundle it all together for extra savings. If you travel frequently, there is no reason you shouldn’t be on Orbitz. The member benefits can save you more money in the long run than any other travel booking website there is, and it’s easy to round out your trips all in one go. Multiple search and toggle features allow you to book exactly what you need in a short time. For one-time travelers, you may find other websites like Kayak to be simpler to use, but even then, you’ll likely find yourself re-routed to Orbitz during booking anyway. If you can spend a few moments getting used to the data-rich website, you’ll be able to find tons of great ways to make your trip wonderful. Have you had an experience with this company? Please share your Orbitz reviews below.